With Southwest Airlines launching new routes to Costa Rica and frequent economy fare deals to airports in both San Jose and Liberia, the destination is more popular than ever. To help you make the most of your trip, TPG Contributor Betsy Mikel offers her best tips from a recent adventure. Costa Rica had long been on my list of places to visit, so I was thrilled to find an affordable fare on Southwest this winter. As I started planning my trip, I quickly became overwhelmed. There would never be enough time for me to visit every rainforest, book every tour or experience every must-do activity that Costa Rica has to offer. Though the country is roughly the size of West Virginia, it offers a mind-numbing variety of activities, sites and excursions. Every single region seems to boast an “unforgettable” zipline, “breathtaking” canopy tours and “the best” wildlife spotting. The hard sell makes sense. Costa Rica is Central America’s most-visited destination, and the livelihood of those who work in the tourism industry there depends on people like us opening up our wallets. If you’ll only have a week or two in Costa Rica, start by figuring out what you want to do. For example, do you want more of a thrill-seeking trip or a leisurely one? The next step is to zero in on which regions offer the most memorable experience for those activities. To help you get started, here are my recommendations for the best places to experience some of the country’s most popular activities, and a few alternative spots that are also worth visiting. Note that this is by no means an exhaustive list (but can at least point you in the right direction) and activities are presented in no particular order. 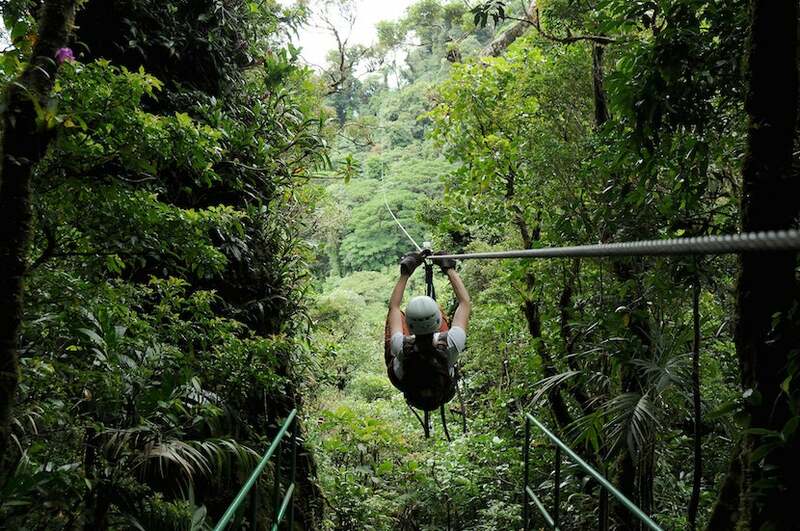 Zip-line through the rainforest canopy alongside scenic Arenal Volcano. Photo courtesy of Peter Hook/Flickr. It’s no surprise that zip-lining is one of the country’s most popular adventure activities for people of all ages. Who wouldn’t want to whoosh through the treetops while high-fiving howler monkeys? Since it’s on the top of most travelers’ lists, there are zip-line cables everywhere. Naturally, some are better than others. For amazing views, photo-ops and adrenaline-pumping zip-lining, head to Arenal and book a tour with Sky Trek Adventures. It’s located just next to Arenal Volcano National Park, one of the country’s largest active volcanoes — don’t worry, it hasn’t erupted since 2010. Sky Trek’s Arenal zip-line tour starts with a gondola ride to top of the forest canopy. You’ll get a practice run on the bunny hill of zip-lines, then it’s time for the big leagues. The only way to the bottom is by zip-lining down seven cables of varying distances and speeds, the longest being nearly half a mile long. As you zip-line from the top of the forest down to the bottom, you’ll pass through several layers of diverse vegetation and if you’re lucky, you’ll get to see plenty of wildlife along the way. Prices start at $77 for adults and $53 for children. The earlier in the day you book your zip-line tour, the better. If you grab the first available morning slot while other travelers sleep in, there’s a better chance you and your guides will have the forest to yourselves. On the SunTrails Montezuma Waterfall Canopy Tour, there’s a pit-stop where you can take a dip and frolic in the waterfall. 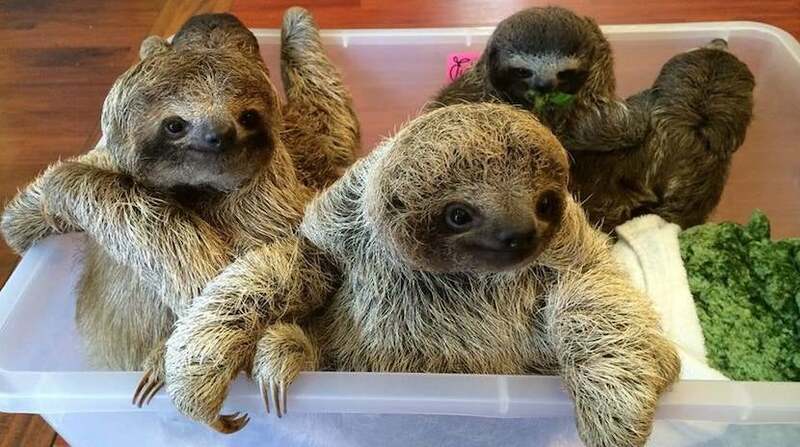 See baby sloths at the Aviarios del Caribe Sloth Sanctuary. Photo courtesy of the Sloth Santuary on Facebook. Spotting a sloth in Costa Rica isn’t difficult. “Looking for monkeys and sloths in Costa Rica is a bit like searching for a needle in a needle stack,” to quote Ray & Sue Krueger-Koplin, authors of Costa Rica Guide. You can’t leave Costa Rica without wowing your Instagram followers with cute sloth overload, and there’s no better place than the Aviarios del Caribe Sloth Sanctuary on the country’s Caribbean Coast. The sanctuary has rescued more than 500 injured and orphaned sloths since 1992 with the goal of rehabilitating them and releasing them back into the wild. The sanctuary and research facility even has an NICU, so if you book the behind-the-scenes tour, you get to see brand new baby sloths. Tickets cost $30 for adults and $15 for kids for a 2-hour tour, or $150 for adults and $75 for children for a 4-hour insider’s tour. The Sanctuary is closed on Monday. Being held by strangers accelerates a sloth’s heart rate and causes them a great deal of stress. Translation: No matter how much you beg, you won’t be able to touch, hold or hug a sloth. You’ll have to settle for a sloth stuffed animal from one of Costa Rica’s many tourist shops. To squeeze even more up-close wildlife viewing into your trip, visit the Jaguar Rescue Center. You’ll have the opportunity to see not only sloths, but also monkeys, birds, reptiles and other mammals. 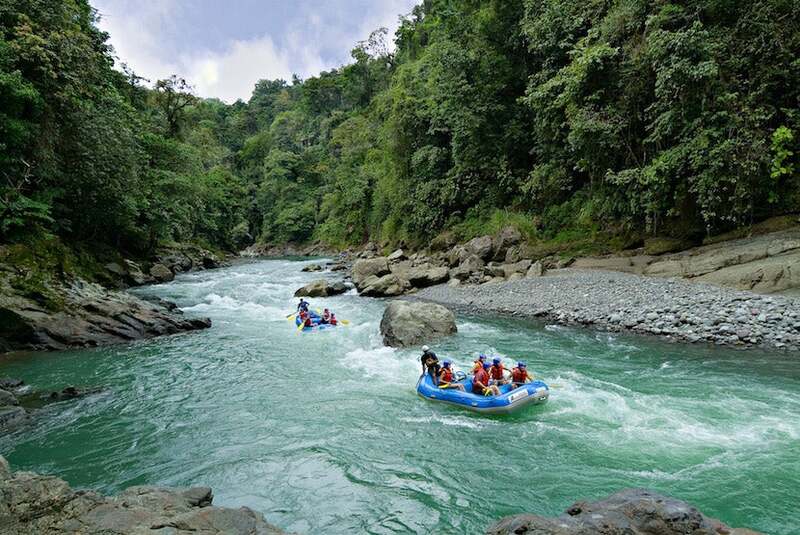 Lush scenery and challenging rapids make the Pacuare River one of the country’s most popular whitewater rafting destinations. Image courtesy of the Pacuare Lodge. The site of the 2011 World Rafting Championship is also one of the country’s most popular spots for amateur paddlers. Stepping into a whitewater raft on the Pacuare River is like stepping into a National Geographic photo. The class III and class IV whitewater rapids flow through canyons, waterfalls and luscious rainforest. Tucked in next to the Talamanca Mountain Range, the Pacuare River feels like a secret paradise with only your guides, fellow rafters and abundant wildlife to keep you company. The water’s warm and the river’s rocks are generally smooth, so it’s not too cold or dangerous if you do fall out of the raft. Note that many tour options are available, prices generally range from $75-$100 per person and most have a minimum age requirement of 12-14 years old. Between transportation to the river, a multi-hour rafting excursion and the trip back, you’ll need to dedicate a full day to whitewater rafting. Meals are included in most tours, as well as pick-up and drop-off in San Jose, Arenal and Caribbean Coast locations. For a tamer experience and calmer waters, head to the Corobicí River in Guanacaste, where you can book a relaxing float trip more suited for kids and older travelers. Playa Manuel Antonio feels like a private beach, granted you arrive early before the crowds. Photo courtesy of roaming-the-planet/Flickr. For some R&R after those epic zip-lining and whitewater rafting adventures, head to the Pacific Coast and visit Manuel Antonio National Park. Though it’s the country’s smallest national park, it’s also the most diverse and is home to more than 200 mammal and bird species. Manuel Antonio also boasts four idyllic white-sand beaches. 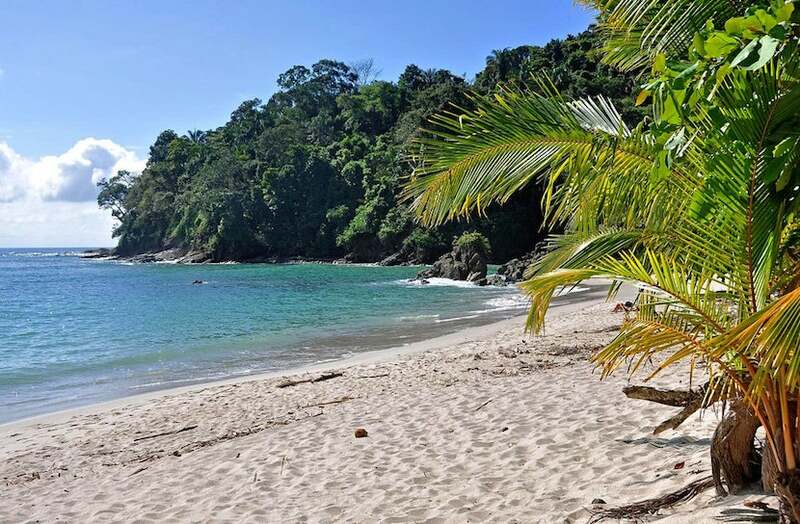 At a short half-mile hike from the park’s entrance, Playa Manuel Antonio is the easiest to access. It’s tucked in a cove that feels private and secret, making it a popular destination — so get there early to avoid the crowds. Visiting the beach is technically free, but you need to pay $16 to enter the park, which is open Tuesday-Sunday from 7am-4pm. Keep a close eye on your possessions if you decide to go swimming. The park’s raccoons, monkeys and other mammals are confident thieves, especially when it comes to delicious snacks. 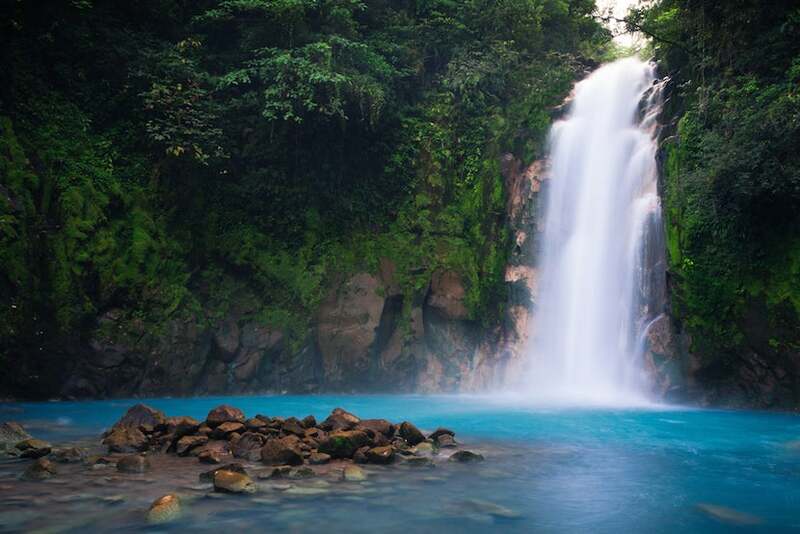 The striking blue Rio Celeste is one of Costa Rica’s best-kept secrets. One of Costa Rica’s best-kept secrets is the Rio Celeste in Tenorio Volcano National Park. It’s worth a visit because the river water has an unusual, you-have-to-see-it-to-believe-it bright blue color that exists here and nowhere else. Local legend has it that after God finished painting the sky, he cleaned his brush in the Rio Celeste, which gives the water its rich, turquoise hue. Scientists attribute the color to chemical reactions from the volcanic minerals in the riverbed rocks. Even though Costa Rica is rife with tourists, the Rio Celeste and its impressive waterfall are still relatively under wraps. The off-the-beaten path destination is not the easiest to get to, and to reach the waterfall you’ll have to hike for at least an hour. Even so, visiting the river promises to be one of the most memorable experiences of your trip. Tenorio Volcano National Park is open 8am-4pm and costs $10 to enter. La Fortuna’s waterfall sees more visitors because it’s more accessible. If you don’t have a full day to hike to the Rio Celeste Waterfall, La Fortuna might be a better alternative. Best Place to Visit Volcanoes: A Three-Way Tie! Head to Irazú to get an awesome view of a volcanic crater. Costa Rica has several active volcanoes and each offers something a bit different. Due in part to its central location, Arenal is the most popular one to visit, which could be either a pro (if you want to do other activities nearby, like visiting the local hot springs, zip-lining or visiting the Rio Celeste) or a con (if you a crave a more isolated-in-nature experience.) Also, because the volcano is so steep, you can only walk around its base and won’t be able to hike to its crater. If hiking to a crater is on your list, then Poás Volcano is your spot. It’s not a strenuous hike, and at just one hour from San José is easily accessible. 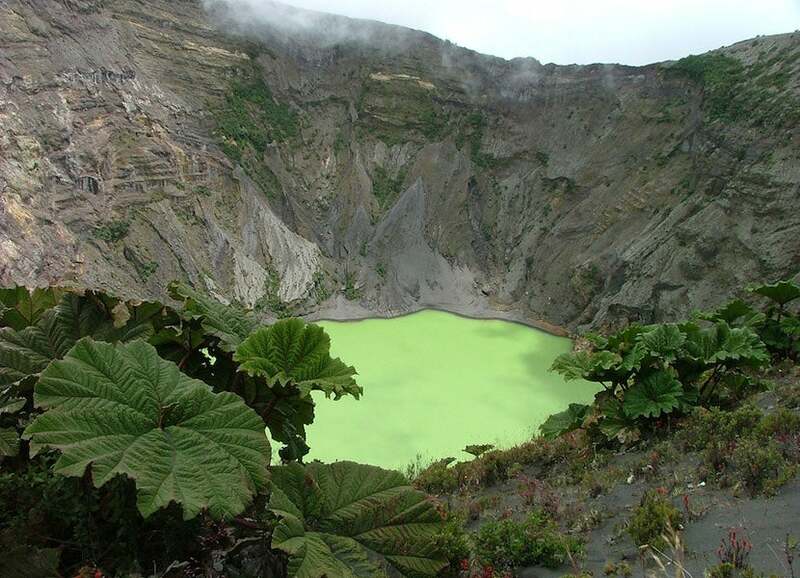 Pending good weather, Poás is your best shot at visiting a volcanic crater in Costa Rica. The best time to visit is early in the morning. Note that since the volcano is located in a cloud forest, fog and clouds may obstruct your view. Some say Costa Rica’s largest active volcano offers the most picturesque views. Visiting Irazú gives you a better vantage point from above two of its craters. It’s about a 90-minute drive from San José, so it’s also pretty easy to get to. There are so many things to do in Costa Rica — from relaxing on gorgeous beaches to zip-lining through beautiful rainforests — it just depends what you’re interested in and what kind of a vacation you want. When paying for hotel rooms during your trip (or getting to them) be sure to maximize your travel rewards by using a credit card that doesn’t charge foreign transaction fees like the Citi Premier Card (which offers 3x points on travel purchases) or the Chase Sapphire Preferred Card (double points on travel). What activities would you recommend to first-time visitors to Costa Rica?